Ceasars Court Hotel and Suites is an architectural masterpiece and epitome of hospitality in the ancient city of Abeokuta. This 3-Star hotel is situated at 7, Koye Majekodunmi Street, Abeokuta, Nigeria in a serene environment. It is well suited for leisure and business travellers. Guests can make their selection from several rooms in 3 categories – Standard, Deluxe and Presidential Suites. 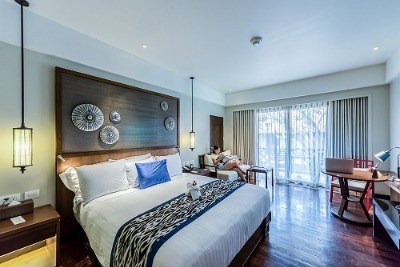 While some rooms could offer extra comfort based on category, all rooms feature air conditioners, reading tables, sofas, an intercom system, refrigerators, king-sized beds and en-suite bathrooms fitted with bathtubs. All guests are entitled to complimentary breakfast. Modern facilities are put in place to ensure maximum comfort. These include: an outdoor swimming pool, a gym, ample parking space, Wi-Fi internet access, event hall, round-the-clock security supported by CCTV cameras, an on-site bar and restaurant where local, Chinese and Continental cuisines can be accessed. Ceasars Court Hotel offers additional services to guests on request such as room service, laundry/dry cleaning and ironing services. Q: Does Ceasars Court Hotel and Suites offer complimentary breakfast? A: Yes, all guests are entitled to complimentary breakfast. A: Yes, the hotel has an outdoor swimming pool. A: Yes, using the hotel’s internet connection is free of charge. Q: Does Ceasars Court Hotel offer airport pickup services? Q: Does the hotel accept payment through bank transfer? A: No, guests will have to pay by cash. Caesars Court Hotel and Suites is a budget hotel in Abeokuta, Ogun. This is really a great hotel. As expected, my room was cozy and neat, water and power supply was stable, toiletries and towels were sufficient and of good quality. It was quite a good stay and worthwhile. My stay at the hotel was good; it was really alright. I only experienced issues coming in and out of the place in terms of its location. Regardless, they were able to provide good services for me throughout my stay there. Although the room I really wanted was not available as at time I was booking , the room I was given was very nice and comfortable. The bathroom was clean and seemed spotless. The toiletries made available were very sufficient. The staff are very dutiful and responsible. They made up part of the reasons my stay was great. I had a good stay at the hotel. The environment was conducive and nice. The staff were nice and efficient in carrying out their duties.The room I stayed in was clean and comfortable with good facilities. An eight over ten for the good services rendered by the hotel. A nice building but they lack professionalism starting from the manager to the kitchen staff and the bar staff. You won't get value for your money. I had a horrible experience with them. Have nice pictures of Caesars Court Hotel and Suites?